Arco-Íris (Leiria, Portugal) on 26 October 2009 in Plant & Nature and Portfolio. great tones in this shot. the background really compliments the rose. whaou, couleur et lumiere magnifique ! But what a Beautiful Dress,for a Death !!! the textures the sharpness and the colors are real good! Lovely texture and light work. I love this, you have inspired me to find a rose for later in the week. a touch of sadness to it, but yet the color and lighting are beautiful! Very warm tones for this red rose passion!!! 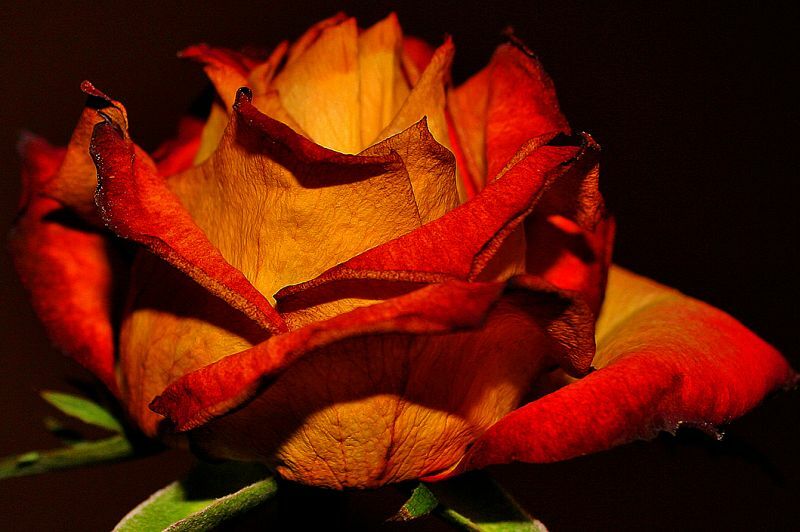 a beautiful rose who gives us all her beauty !!! The light is perfect !! The lighting and rose itself is fabulous ! Love the texture and light! wouaw, ces couleurs sont magnifiques. As cores e as texturas são magníficas. Even as it fades, it's still beautiful. This is a wonderful image. Very well done. Wonderful color and detail! Very nice capture! So beautiful, so real, so sad... so touching! Amazing capture! I like the dramatic lighting. Exquisite detail, color and depth. What a crispy detailed rose. This is very beautiful. wow!! maravilhosa, adorei as cores. Dead, nevertheless, it looks beautiful. Brilliant colours! Love how sharp the petal veins look. Wonder if its a camera flash or some other light source. Muito bem. Foto espectacular. A luiz, focagem, enquadramento, tudo excelente! Fantástica macro, com cores e luz igualmente fantásticas. Bom trabalho de processamento. Although dying, it is still beautiful to look at. The colors stand out boldly still. Some deaths seem much more beautiful to look at than others ! Fantastic! What a great shot! Estupenda foto... una luz y unos colores preciosos ! Colour and texture here are stunning!